3. Refined Sunflower Oil, which are marketed in AP, Telangana, Orissa and Karnataka only. for further queries regarding scheme, call on 040 3090 6474, from 10am to 6pm(Mon-Sat), caller to bear the cost of call. 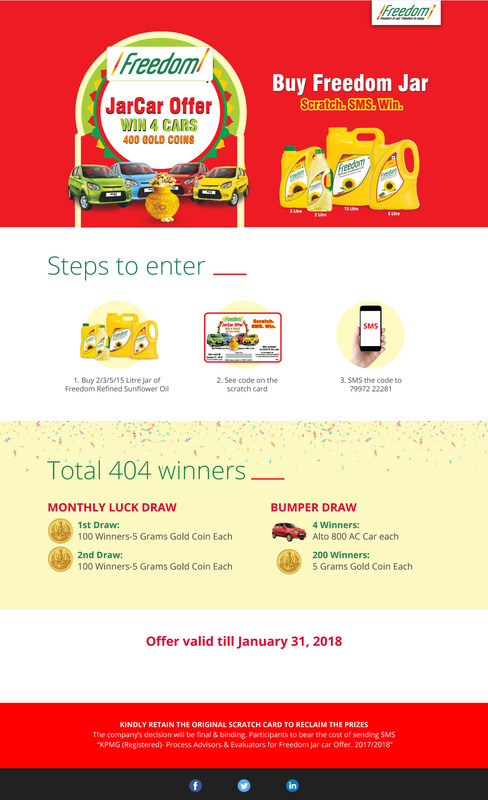 These terms and conditions are in addition to the terms and conditions stated on the website for the Freedom JarCar offer. By participating, you expressly agree to these additional terms and conditions. 4. Reasonable attempts will be made to contact the winners to collect their prizes. Maximum 3 attempts to call the winners will be made in a span of 1 hour for each participant. If the participant does not respond, they will be disqualified and the next winner in line will be selected. Efforts will be made to follow the timelines. However, in the event of circumstances beyond the control of Management, these timelines may need to be altered.